I've previously mentioned about Marvel's version of their exclusive Target version of selected comic books, and I thought it was really cool that a department store like Target would carry comics. Well it's cooler now, is that they are also carrying Trade Paperbacks. One of them is a stripped down version of AVENGERS VISIONARIES: GEORGE PEREZ. The Target book only reprints AVENGERS #161, AVENGERS #162, AVENGERS #196, AVENGERS #201, AVENGERS ANNUAL #6 and AVENGERS ANNUAL #8 (missing are the two AVENGERS #194 and AVENGERS #195). The tradeoff for less the two issues is that the paper and color printing has been upgraded, and the price is somewhat cheaper at $13.99 vs $16.95, but given inflation as it is, you should probably add one or two dollars to the original price. The nicest thing is that the paper is bright white, glossy paper, similiar to the Barnes & Noble Marvel Classic books. The colors was also enhanced by a computer, so the colors are bright and blended much better than the original printing. As you can see the computer misinterpret Whizzer's yellow costume as white and left that one area colorless. But it still looks much better than the original block color (interlaced with small white areas). The strangest thing is, and I know that this was originally George Pérez as the theme in the book, but the cover does not indicate it is Perez's book - nor does the main content page lists George Pérez as penciller! All the inkers, original colorists, editors, writers are listed, but not George. Still, I think this is a great program for casual shoppers to give these comics a try. I'm looking forward to more titles. 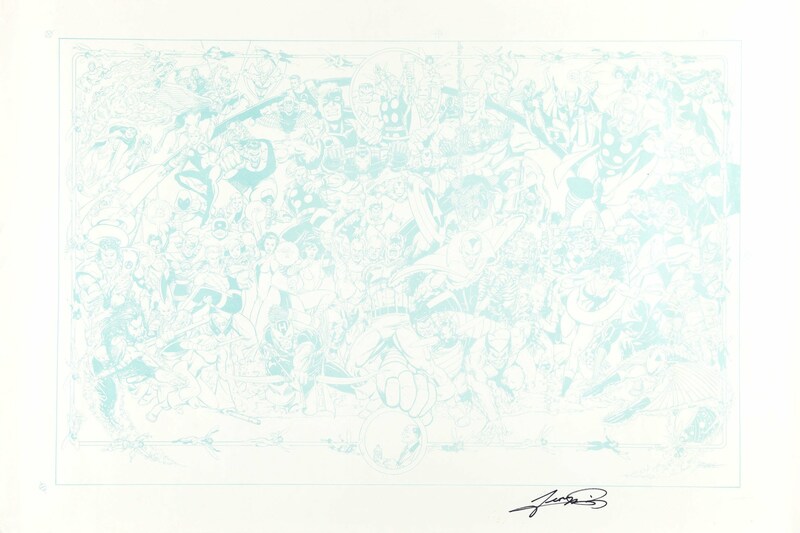 George Perez - Original Cover Art for Avengers Visionaries Trade Paperback (Marvel, 1999). This incredibly detailed cover was specially created for the trade paperback by Gentleman George Perez. The book reprints a classic Avengers storyline featuring the Squadron Sinister drawn by Perez. Even close-up it is hard to imagine how this work should ever have to be reduced because the detail is incredible. Any one part of this work could be a cover in itself! Some slight white-out and rework on Thor's hand and Cap's shield but otherwise pristine. Overall size is 11" x 17", image size is 10" x 15". Signed by the artist at the bottom of the page. Important notice: We expect to be auctioning lots at the rate of 200-250 per hour. Sometimes eBay Premier live bid software cannot keep up with that pace, so we strongly recommend that you place a realistic proxy bid now as insurance to avoid disappointment. Also please note that all Heritage/CAA lots purchased through eBay Premier carry ! a 20% Buyer's Premium. Please make sure you read the Terms and Conditions. > I was looking at Amazon.com and they list this book to be published in January 2003 - at first I thought it was the AVENGERS VISIONARIES: GEORGE PEREZ TP (which was published July 1999). Same book, slightly different title to better fit in with our current TPB structure. This item will be published in January 2003. You may order it now and we will ship it to you when it arrives. Seeing as how one of the big comic book events of 2002 is going to be the JLA/Avengers team up, I thought it might be fun to take a look at the work of the man who has been connected to the project from the very beginning, George Perez. As much as I love the man’s work, I don’t think I could recommend this collection to a new reader or another Perez fan unless they have to have EVERYTHING related to the man. You’re better off spending your money on one of the trades collecting his recent Avengers run or waiting for Marvel’s “Essential Avengers” black and white collections to reach Perez’ run.